One of the difficulties in writing about contemporary jazz as a genre lies in that each artist understands and embodies music in his/her own unique way. This is particularly true of guitarist and composer Timucin Sahin. Born in Turkey, Sahin studied jazz and composition in Amsterdam, before moving to NYC. In the span of a decade and a half, Sahin has established himself as an innovator with a very adventurous voice, with five albums as a leader and an impressive career as a composer and educator. An accomplished instrumentalist, Sahin draws from a plethora of modern styles, crafting a personal language that is as fluid as it is unpredictable. 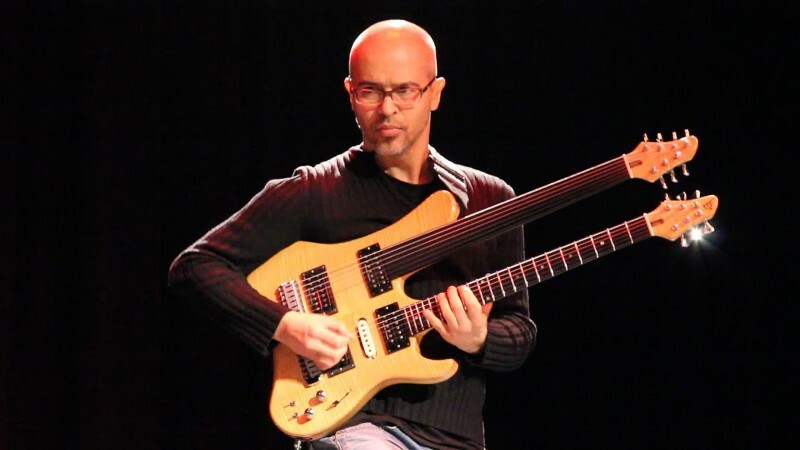 In this he explodes his distinctive choice of instrument: a guitar with two necks, one of them fretless, which allows him to sway with uncanny ease between the conventional tempered sound and the rich elasticity of the smooth fretboard. Listening to his band, it might be tempting to compare Sahin’s music with other fertile, highly virtuosic cross-genre experiments (e.g. John McLaughlin’s Mahavishnu Orchestra or Steve Coleman’s Council Of Balance). But this is because it is impossible to classify his sound. Sahin’s kaleidoscopic, highly architectural style is intricate and effortless, abstract yet visceral; its meaning is sometimes evocative, others elusive. His music certainly poses challenges to us listeners, but they appear like invitations to careful listening. There is an underlying earthiness that binds it all together, a rhythmic impetus that leads us in a surprising journey through an otherworldly soundscape. No Replies to "TIMUCIN SAHIN"